Rockwell's new table saw looks nothing like the table saws you are familiar with; the saws you know and love. In fact the only thing similar about it is the table. 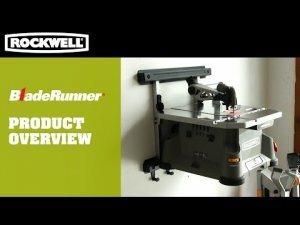 The BladeRunner from Rockwell can accurately be described as a jigsaw mounted in table, upside down. In the past we have seen rigs that allow users to mount their own jigsaws under tables, but the BladeRunner takes the idea a step further by offering an all-in-one package. It looks like Rockwell's target audience is DIYers and craftspeople. I really cant see this saw being used on the typical jobsite, but who knows. The saw is similar to both a bandsaw and a scroll saw, and can do some of the jobs both can do, but it is not meant as full replacement. The BladeRunner uses standard T shank jigsaw blades that can be found at any hardware store, and offers a cutting capacity of 1-1/2 inches. I don't see this mentioned anywhere, but it would be nice if the saw had some type of upper roller guide system that would stabilize the blade. Update: After watching the video a few times, It does appear that the saw has an upper roller guide. This feature should greatly improve the quality of cuts.